Both Manchester City and Manchester United desperately wanted to sign Neymar this summer, according to reports in Spain. 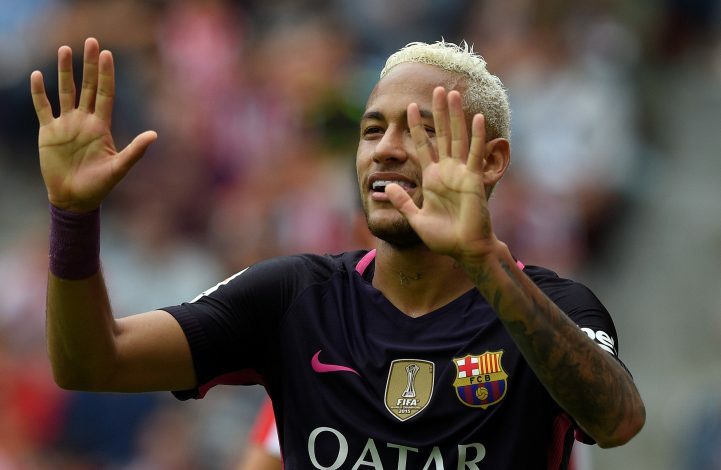 Neymar left Santos to join Barcelona in the summer of 2013, signing a five-year deal with the Catalan giants. Since joining the La Liga club, he has managed to establish himself as an important part of the team, forming a deadly attacking trio with fellow teammates Lionel Messi and Luis Suarez in the process. Still only 24, the Brazil international is already one of the best players in the world. And naturally, his talents have attracted the interest of top clubs from all around Europe. In fact, as per Spanish newspaper Mundo Deportivo, both Manchester City and Manchester United are heavily pursuing his signature in the summer transfer window. And along with the two English powerhouses, Paris Saint Germain and Real Madrid were also in the race for the Brazilian’s services. All four clubs were willing to pay Neymar’s release clause, which is worth €190 million (£170m). However, PSG were the ones leading the race, thanks to their mammoth wage offer of €17.2 million per season, which could have further risen up to €22 million per season! But all four clubs ended up failing n their pursuit, and FC Barcelona emerged on top once again, by securing their star man’s future with a long term contract. Neymar then revealed the reason behind him turning down all these major clubs.